Manchester City winger Raheem Sterling fired England into the lead against Spain in the 16th minute of this evening’s matchup after a great assist from Manchester United’s Marcus Rashford. 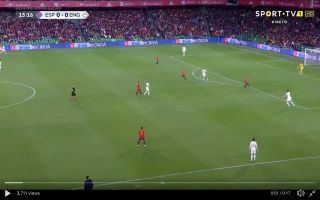 Gareth Southgate’s England launched a devastating counter-attack starting from goalkeeper Jordan Pickford, Pickford launched the ball into midfield before Rashford played an excellent pass into Sterling leaving the Spain defence helpless. Sterling produced an excellent finish to smash the ball past David De Gea who could do nothing to prevent the ball from hitting the back of the net. Sterling’s goal this evening was his first for the Three Lions since October 2015. It was well worth the wait. England look like rejuvenated side under Gareth Southgate and fans are hoping the national team’s success continues for a long time to come.